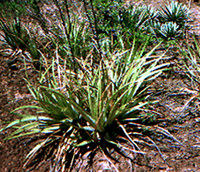 The other most common genus of bromeliad in Mexican tropical dry habitats is Hechtia. Unlike Tillandsia, Hechtias grow in the ground. They are often very substantial, stiff, and prickly, resembling Century Plants (Agave in the Agavaceae).